If you are a domain name investor or regular visitor of GoForTricks then you should be aware of Top domain name appraisal Tools of domain industry. Now a days it has become a essential to appraise your domain name before selling or before buying a domain name. For newbies it is very hard to get the estimated value of domain names. Because sometimes we receive the emails from unknown person giving you price more than its estimated value. 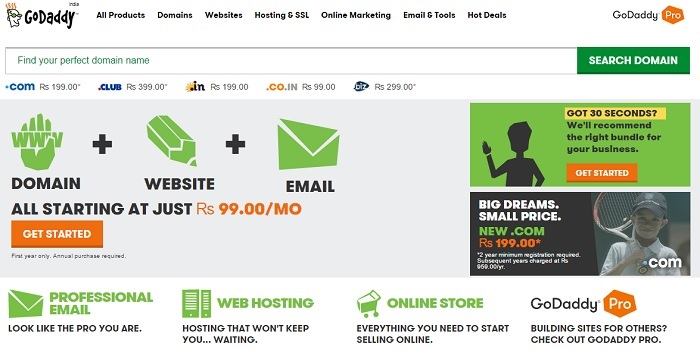 These are the scams which generally happens in domain name industry so be aware of these scams specially for newbies. So before buying and selling a domain name we should check the domain name appraisal value to get the near by idea in your mind. 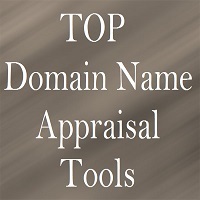 These domain name appraisal tools makes easy domaining industry. there are many more factors which use the estibot in his algorithm but we divided into these three parts for better understanding the logic behind appraisal. 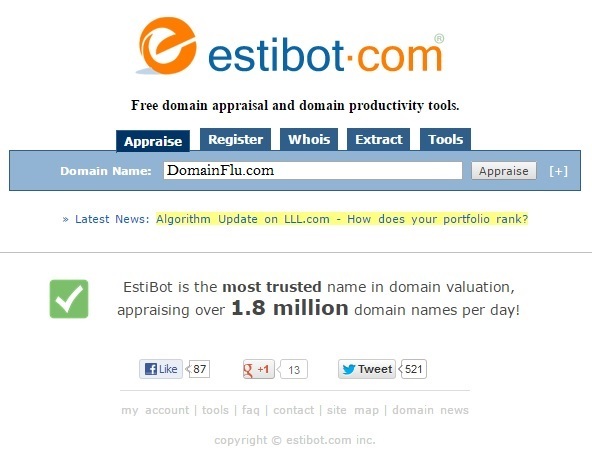 Estibot break the domain name into keywords and then give a category to your domain name which shows us in results. This one is also known as one of the best tool in domain name industry. This best thing about this domain name appraisal tool is that shows result in the index by reading this index you will get every information about your domain name. These all options valuate shows you in a table manner and also you can sell your domain name by clicking on “Sell” which will redirect you to Cax. You can appraise more domain name simultaneously. 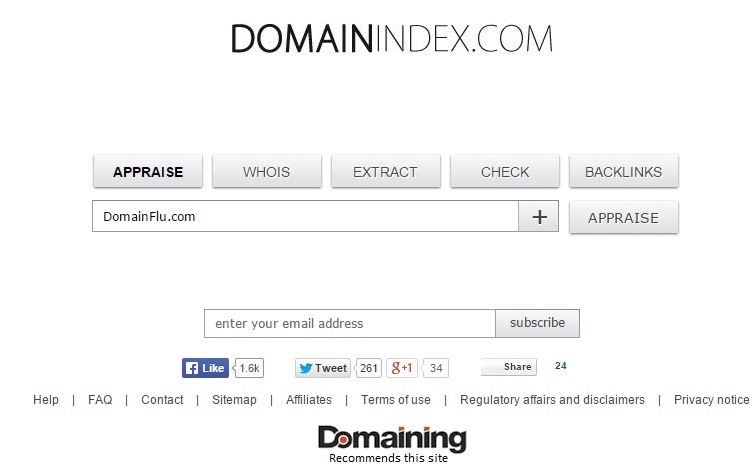 Domain index show some additional feature in it. Domain index shows appraisal value of your domain name , Who is records and Back links of your domain name. Many domainers and webmaster use this tool widely. Sedo is world’s largest domain brokerage service in terms of buying and selling domain names. So this is one of the famous name in domain name industry. Sedo also provide facility to appraise your domain name. But we need to register on SEDO Before we appraise our domain name. After registration when we add the domain name in our portfolio then sedo automatically appraise our domain name. So that we can get an idea for how much we should sell our domain name. Godaddy is world’s largest domain name registrar. It is known for its cheap domain names because it provides us domain name in very competitive prices. So people mostly like to purchase the domain name from the godaddy. Godaddy Domain Appraisal provides the facility to apprise the domain name for this we need to register it then we can appraise the domain name from this godaddy appraisal tool. 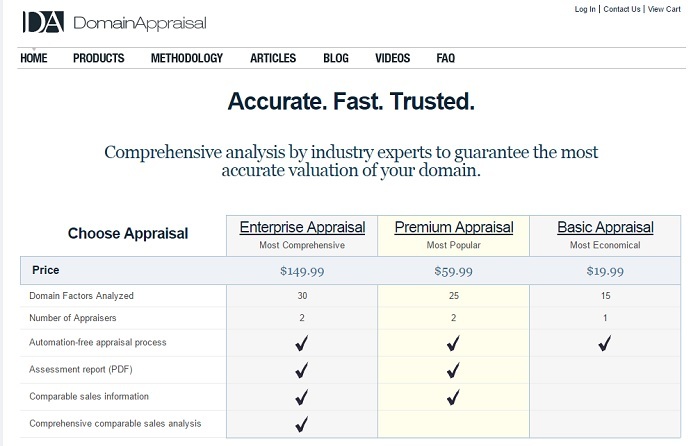 Domain Appraisal provides appraised value of your domain name, Comparable sales information and Comprehensive comparable sales analysis. This was all about the top tools used in the domain name industry to appraise the domain name. Know More About Check Your Domain Blacklisted Or Not? ?